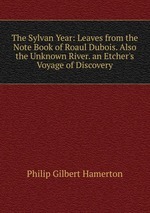 Аннотация к книге "The Sylvan Year: Leaves from the Note Book of Roaul Dubois. Also the Unknown River. an Etcher`s Voyage of Discovery"